After a great tour of Tupelo by the Pritchards’, Cori and I took the 83 mile journey north to Elvis’s other hometown of Memphis. We had the opportunity to take in the sights and sounds of Beale Street and taste some “Pork with an Attitude” from Pig on Beale. Sunday morning we had the pleasure of meeting for the first time our new friends from Memphis that are exploring the possibility of starting a Fuller Center for Housing covenant partner. 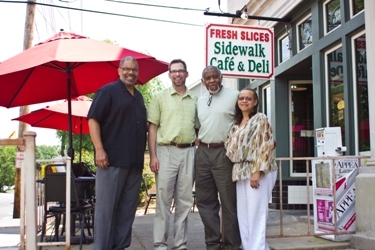 Levi and Deborah Frazier and their good friend Bill Jones are involved with a nonprofit called The Blues City Cultural Center , which is a thirty year old community arts/social service organization that promotes leadership and empowerment via the arts and communications. Their group does many wonderful things with a philosophy similar to that of Community Renewal International in Shreveport, but they wanted to find a way to create a housing component of their work. I shared with them the opportunity of the Save A House –Make A Home initiative and they are planning to visit Shreveport and Louisville to learn firsthand how their unique strategies have been successful and what they might incorporate in their efforts in Memphis. Bill Jones is a FedEx Express, Ramp Tower Controller and his tenure as Chairperson of the Blues City Cultural Center Board of Directors is concluding and he expressed interest in starting the Fuller Center covenant partner in Memphis. He is also an HVAC contractor so he has a lot of friends in the construction business that he will be contacting to help create their new board. Levi and Deborah drove us to the National Civil Rights Museum where their son used to be a docent – a highly trained guide that gives tours of the exhibits. 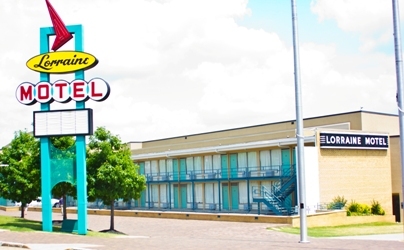 The museum is located at the historic Lorraine Motel where Dr. King was assassinated. It was very emotional to be overwhelmed by the Civil Rights displays and then to to find myself in the room Dr. King stayed in moments before his death. The square concrete with his blood stains was recently removed. I looked out of the balcony of his room and could see the window from which his assassin took aim. I didn’t see any references to or displays about Koinonia Farm and perhaps after the Clarence Jordan Symposium in September, I’ll ask the museum to recognize this important piece of Civil Rights history. There area couple of very interesting connections between Dr. King and Dr. Jordan. Read this interesting and previously unrecorded story about the only time they ever met in this month’s edition of Baptists Today. There is also the well documented story about one of the co-founders of Koinonia, Martin England, who was successful at selling Martin Luther King, Jr. a life insurance policy only months before he was assassinated on April 4, 1968. England’s effort to protect King’s wife and children became the basis of the story of our Fuller Center friend Tony Campolo’s book, "Everything You Heard is Wrong." 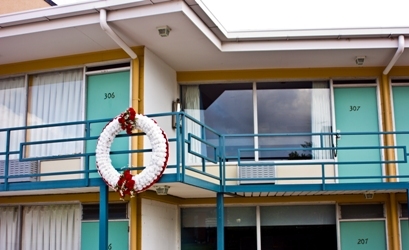 It is very exciting The Fuller Center is building in the land of the King Elvis and perhaps soon where Martin Luther King, Jr. gave his life to help some poor city sanitation workers who undoubtedly were living in horrible housing. Housing was important to Elvis’s career too. We often conjure up images of Graceland when we think of Elvis’s home. But he didn’t start there. 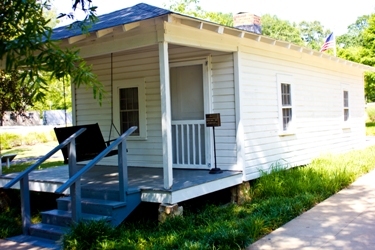 It is amazing that he began playing music in the little shotgun shack in Tupelo. But what is even more amazing is that Elvis’s family lost that house in 1938 to foreclosure when his dad was arrested. He and his mom lived with relatives in Tupelo for 10 years until they moved to Memphis where the bounced around from one rooming house to the next until finally being approved for public housing. His shyness, perhaps low self-esteem from his family’s struggles combined with his fascination for mixing gospel and hillbilly music held him back from any performance success. Yet his musical calling wouldn’t let go of him and he often soaked up the sights and sounds of Beale Street. Finally a break. According to Wikipedia, Elvis competed in Humes’s Annual "Minstrel" show in April 1953. Singing and playing guitar, he opened with "Till I Waltz Again with You", a recent hit for Teresa Brewer. Presley recalled that the performance did much for his reputation: "I wasn’t popular in school … I failed music—only thing I ever failed. And then they entered me in this talent show … when I came onstage I heard people kind of rumbling and whispering and so forth, ’cause nobody knew I even sang. It was amazing how popular I became after that." Millard Fuller said, "A house is the foundation stone on which human development occurs. If a family does not have a good, decent place to live on terms they can afford, they are in trouble as a family." Poor housing could have crushed the spirit of Elvis and he very easily might have never made it to a stage. How many children in your community will fail to reach their potential because of a lack of decent housing? These are the thoughts that keep us motivated. Learn more about Fuller Center president and co-founder David Snell’s new Save A House-Make A Home inititive to address the foreclosure crisis in America.